Surprises can be found around any corner. 1 time I receive too little change. 1 time they thank me for my honesty. 1 time they say "Thank you," or "Your welcome." That 1 person in 7 usually gets my business again. I ended up playing more than I expected. I played two games of Yinsh with the daughter before lunch. I won the first game fairly easily, but the second one was very close. My friend then surprised me in the afternoon by agreeing to a game of Chess. And I thought he didn't play games altogether. I actually gained a very slight advantage at the beginning but then made a mistake which threw the balance his way. A series of exchanges later I resigned. He turned out to be a reasonably good player, or, at least, better than me. I then played a few introductory games of Go with the daughter again, six in all. On a 9x9 board, I started her with a 2 stone advantage that eventually went up to 5 stones. She still couldn't win. I think I'm not a good introductory Go game teacher. Anyway, I discovered something playing the game: a corner of the board with four empty spaces in a square, surrounded by five stones as the two other sides a square, can't be saved, even though two eyes could fit into it. Gaming prospects for the coming shabbat are light. This is because our guests for the whole shabbat are a family of the non-gaming variety. The daughter aged 14 or so plays; I might get a game in with her. And if I'm lucky, maybe a Puerto Rico game with Rachel in near the end of shabbat, if she doesn't mind us ignoring our guests. Beijing apparently is waking up to board games. First article on traditional and modern board games in China. Second Article on a new restaurant with board games and other activities. Students of information architecture at the Savannah College of Art and Design designed several board games as part of an assignment. The first is Operatives: "Players are divided into two teams, the corporation and the spies, with the objective being to either protect the corporation’s five-word message or to steal and decode it in order to win." A board game version of Netrunner? The second is Nano: "Players add or lose bonds depending on where they land and receive points based on whether or not the atoms are the correct color. The player with a finished molecule or with the most coordinating pieces wins." The third is Logistics: "... players compete to buy the most manufacturers to produce product and retailers to sell it." Raph Koster is forging forward on the topic of fun, games, and grammar. His latest talk at ETech looks like it was very interesting. When I reviewed his book, A Theory of Fun for Game Design, I proposed that the book was more about the theory of art in games than fun in games. This talk looks like a definite step back in the fun direction - less about internal transformations, and more about pleasure. I'm looking forward to his next book, A Grammar of Game Play: How Games Work (due out when, Raph?). Merscom will be bringing Ingenious to the PC. Details here. The Herald Tribune talks about the shortening of board games. Apparently, Hasbro's down to 51.3% share of the marketplace, listing both Mattel and Cranium as its competitors. Here's an article about a prisoner who hanged himself. And what, pray tell, does this have to do with board games? Apparently, the "attention" buzzers were taped off and the lights ignored while one guard was teaching the other how to play Backgammon. The latest Jerusalem Strategy Gaming Club session report is up here. 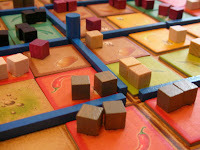 Games played: Mykerinos, Taj Mahal, Tichu. Feminist Gamers takes some analog time to play Eurogames. Strat-O-Matic is up for sale after 45 years. Rubber frogs "to plague your seder". The perfect thing to throw onto Aunt Petunia's plate while she's not looking. You may think you've seen bad English, but you haven't - until now. I have in my possession the absolute worst user guide ever written in what I can only suppose was supposed to be English. Bar none. I've been on the Internet for 22 years now. I've seen all the funny foreign signs about maids and swimming pools, I've seen all the "Engrish" sites. With most bad or funny translations, you can kind of figure out what they were trying to say. Not with this one. 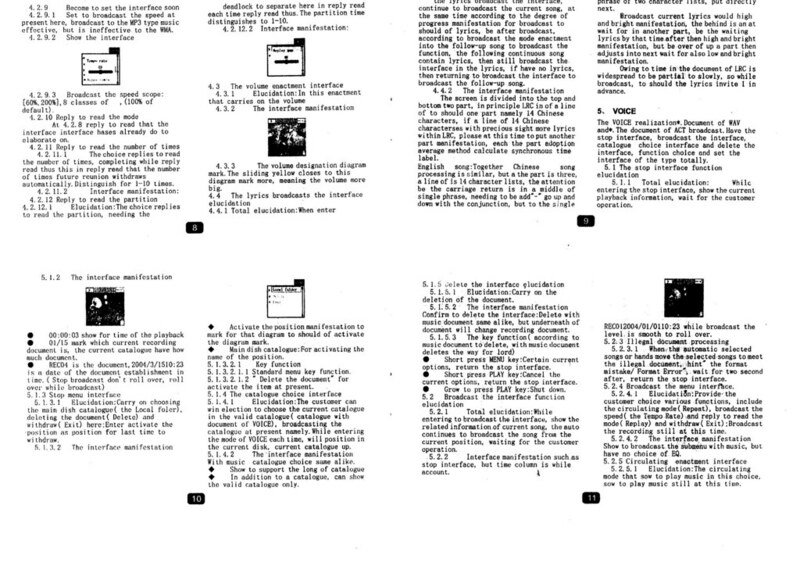 I challenge anyone to figure out a single sentence from the entire twenty-two pages of this guide, which allegedly describes how to use an Infinity "mp34 player". It looks to me like somebody thought that simply running Japanese text through an automatic conversion tool wasn't bad enough, so they ran it first through Japanese to Chinese, then Chinese to Korean, and then, as an afterthought from Korean to Swiss. And the original text was probably wasn't even Japanese. Maybe it was in Sanskrit. Well, here it is: The Absolutely Worst User Guide in the Entire World. Ever. 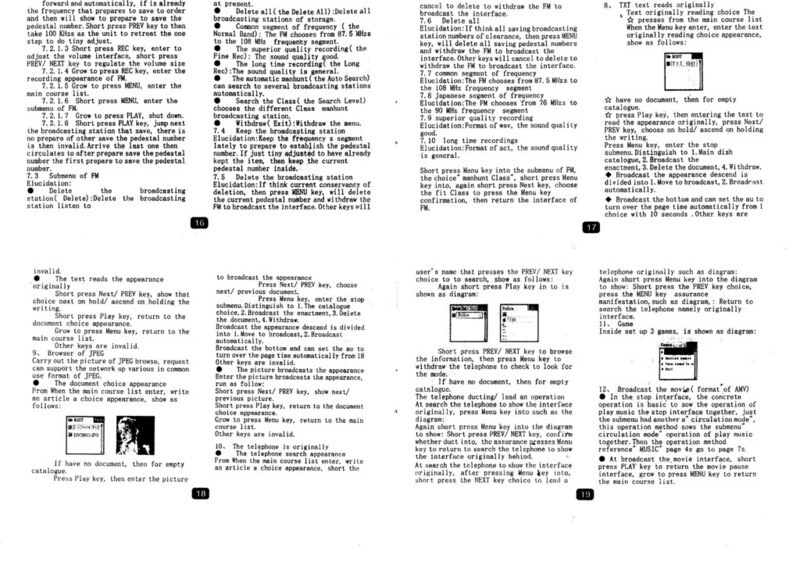 Click through to the large images to read the text. Don't get too close; you don't want your brain to explode. 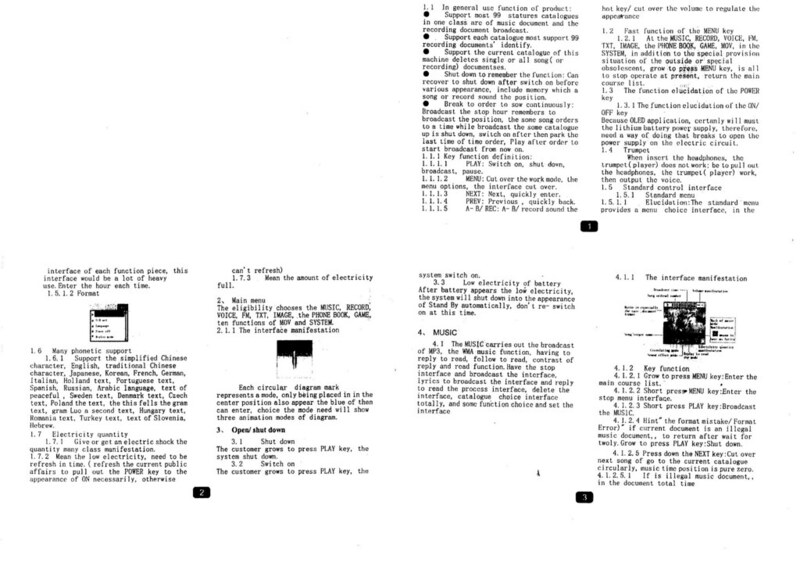 Break to order to sow continuously: Broadcast the stop hour remembers to broadcast the position, the some song orders to a time while broadcast the some catalogue up is shut down, switch on after then park the last time of time order, Play order to start broadcast from now on. Elucidation:The sound effect mode that sow to play music in this choice, sow to play music still at this time. 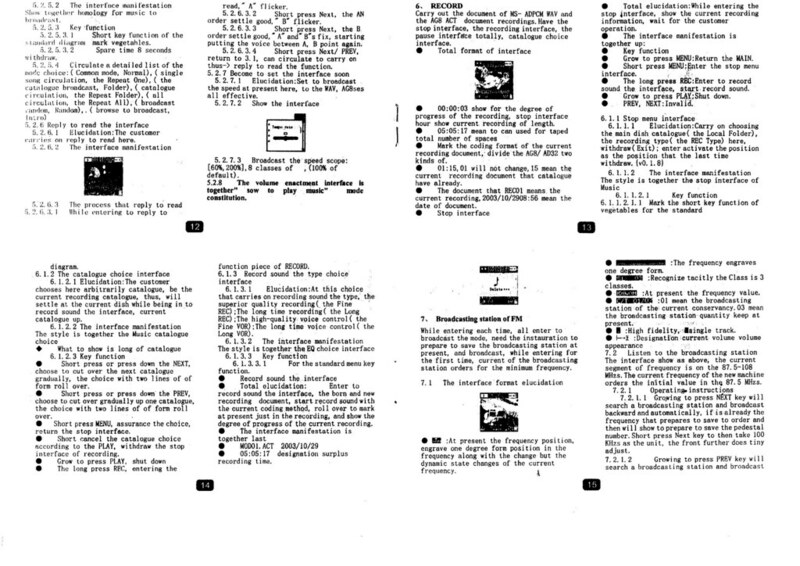 Total elucidation: When enter the lyrics broadcast the interface, continue to broadcast the current song, at the same time according to the degree of progress manifestation for broadcast to should of lyrics, be after broadcast, according to broadcast the mode enactment into the follow-up song to broadcast the function, the following continuous song contain lyrics, then still broadcast the interface in the lyrics, if have no lyrics, then returning to broadcast the interface to broadcast the follow-up song. 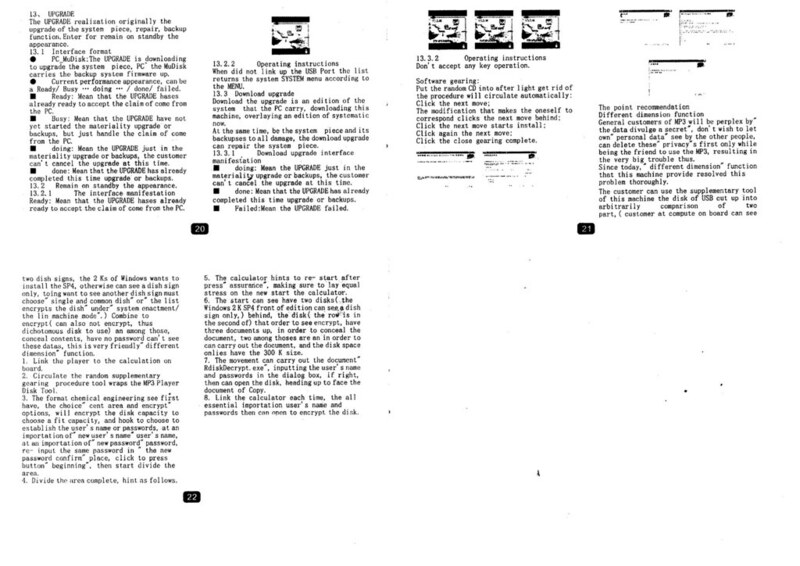 Total elucidation: Enter to record sound the interface, the born and new recording document, start record sound with the current coding method, roll over to mark at present just in the recording, and show the degree of progress of the current recording. Short press Menu key into the submenu of FM, the choice" manhunt Class", short press Menu key into, again short press Next key, choose the fit Class to press the Menu key confirmation, then return the interface of FM. The format chemical engineering see first have, the choice" cent area and encrypt" options, will encrypt the disk capacity to choose a fit capacity, and hook to choose to establish the user's name or passwords, at an importation of" new user's name" password, re- input the same password in " the new password confirm" place, click to press button" beginning", then start to divide the area. By the way: the box? It reads: "Music Digital Player, The Earth Music Wind Lead By Me." This post is intended for non-commercial purposes. Although I believe the guide has no artistic merit, and therefore does not warrant copyright, I believe that my reproduction here is fair use. One's English and Hebrew birthdays align every 19 years - or so they would have you believe. The truth is that the English leap year causes a bit of havoc with this calculation, and therefore the 19 year trick is only true for about 8 out of the 19 years in each cycle. For the other 11 years, after 19 years the Hebrew and English dates will be off by one day. However, in my case it actually works this year. I will be 38 on the first night (and day) of Passover, as well as 38 on April 3, which is the same day. So, happy birthday to me, next week. And yes, I know that a syzygy is an alignment of heavenly bodies, but if you knew about my body, you would understand wh... no, even I can't pull that joke off. He feels fine, by the way. 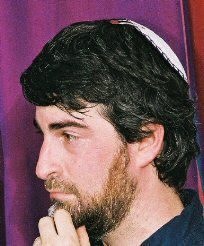 His Hebrew name is Menachem ben Miriam, if you would care to pray for him. He will be 70 years old this year. I start with the Post-Tribune, who records a "Chess for Christ" event. Board games certainly seem to go well with religious functions. Speaking of everyone winning, Scott Weiss just did something rather unusual on the Jeopardy game show. He purposely causes a three-way tie, in order to give more money to his opponents, at no cost to himself. Read this article for details. More proof that "winning" isn't necessary to win. There are many new business games produced each year, but The Enterprise Game doesn't look too bad. It's got a pick-up-and-deliver mechanic, which I generally like. Midland college offers a course in video game design, but an official associated with the course added, "Ironically, it's easier to teach gaming concepts using board games because the same rules come into play such as how you win, how you lose and how you lose a turn." Perhaps that's because video game designers tend to produce puzzles and finger exercises, rather than games. Jerusalem (Yehuda) - Yesterday evening, Almighty God revealed to well-known blogger Yehuda (http://jergames.blogspot.com) that He has filed suit in the Divine Court against all IP holders for misrepresentation and violation of IP agreements, covering all of His copyrights, patents, and trademarks. "A bunch of idiots running around claiming they 'invented' this or that. What a bunch of malarkey," God is reputed to have said. "Where do you think they got these ideas to begin with? Just 'popped into their head', eh?" God maintains that He is the original source of all ideas that spontaneously appear in all human's brains, and as such, He claims all IP rights over these ideas. According to God, He agreed to plant these ideas among various people on Earth only so that these people could act as disseminaters for the ideas. For their efforts, He agreed to recompense these disseminaters with limited payments, only to find that they would not give up the ideas and instead claimed them as their own. "God is very hurt by these people's actions," said Yehuda. "He gave the ideas in good faith and now these people are claiming that they thought them up by themselves. As a result, His ideas are not reaching all of His people. God has half a mind to keep all of His remaining ideas to Himself." The suit was filed in Divine Court, the only court that regularly hears cases between the Almighty and humans on Earth. Most cases heard by the court are petitions against God. While not unheard of, this is one of the few cases where God Himself filed the petition. "My client is pretty confident of victory," said Yehuda. "He won big in the Babel Tower design infringement case. He's won a number of victories regarding the Jewish people. He's feeling good about this." Yehuda further hints that God is also looking closely at cloning developments to consider a possible patent infringement lawsuit. There are a great many card games where the object is to get rid of your cards. These games are called "shedding" card games. Shedding card games come in various shapes and sizes, and originate from a diverse range of cultures. In Patience games, you rid your cards by placing them on stacks in immediately ascending or descending numerical order. You probably know the ubiquitous solitaire game Klondike that comes with every Windows box. There are four stacks, one in each suit, going up from ace to king. Spit is a patience game where there are no turns, and the object is to move your cards as physically quickly as possible. There is one stack for each player, and cards can go either up or down; suit doesn't matter. In Cheat (also known by a more common name which is rude), you place your cards face down and announce how many you placed, but may lie about them. One stack, always ascending, but multiple cards may be played on each turn. Additional games in this group include the proprietary games Flinch and Skip-Bo , descendants of a game called Spite and Malice. In these games, if you can't play, you place a card in a discard pile that will come back to haunt you. Uno and similar games, such as Crazy Eights and Taki also use this mechanic, but introduce special cards that break the rules, allowing you to play multiple cards or out of order. These games also have a single stack, where cards either ascend or descend, or change suit. Ladder or Climbing games also require players to play cards in numerically higher order, and not necessarily immediately numerically higher. However, in addition to single cards, pairs, sets of pairs, and other combinations can sometimes be played. When no one can play further, often the last player to play collects the played cards and starts again. In Karma (also more often known by a rude name), each player gets 3 face down cards, 3 face up cards, and has to play cards onto the central pile in ascending order, although not necessarily the immediately numerically higher card. Various cards have special abilities that discard the stack or require a lower instead of a higher card. Tichu is a Chinese variant climbing game, very popular among the gaming cognoscenti right now, mostly because it is a partnership game. Like most ladder games, the first card or cards played can be a single card, pair, multiple pairs, a full house, or a straight, and subsequent plays have to be of the same type, but higher. Another game in this genre is Tien Len, which counts as its descendants proprietary games such as The Great Dalmuti and Frank's Zoo , as well as President (yet another game with an alternative rude name). Melding games require you to be the first one out by combining sets of cards from your hands, either cards of the same number or straights of three of more numbers. The first one out may be the winner, or may simply get a bonus while the melds played count to your points. Nearly all Rummy games, such as Rummikub , Gin Rummy, 500 Rummy, Tripoley , and so on, are melding games. In these games, you pick a card, try to form melds, and then (usually) discard. Simple melding games include Old Maid , where you need only pairs, and Go Fish , where you need only fours of a kind. Of course, there are always a few oddball games. Mao is a game where the rules are kept secret during the game. Each player tries to play a card, and the person who knows the secret rule can penalize the player if they play (or do) something wrong. It's very silly. Durak is a Russian game where you play cards by attacking the player on your left. Other people can add to the attacking cards, and you can either defend yourself by playing higher cards or pass the attack on to the next player by adding attacking cards. It's a bit of a free-for-all; cheating is explicitly permitted in the game. Information about all of the games can be found on Pagat, Wikipedia, or Boardgamegeek. I'm a professional technical writer, user experience consultant, gamification consultant, blogger, and game designer born in the US and living in Israel. I'm 46 years old, divorced with two children, and have been programming since I was 8 years old (starting on a PDP-11). A total geek. I'm passionate about the Internet, especially its effect on culture and technology, as well as writing, ethics and manners, my family and children, my Judaism, and board games - not necessarily in that order. Actually, I'm passionate about many other things; you can read about most of these things on my blog. My articles have appeared on major blogs around the world, been printed in various game, technical, and legal journals, and (apparently) hang on a few walls. 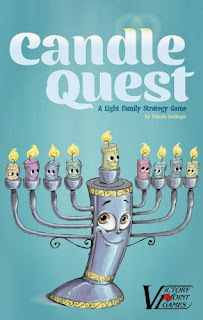 My first published game was first published in two editions and two apps, and a new version called Candle Quest has a new theme. I also designed and ran several games or events for several thousand participants at game conventions and at various companies for which I have worked. My online resumé is here. A more traditional resumé is also available upon request. Yehuda mostly covers board games, but also contains my random thoughts on ethics, culture, philosophy, law, technology, politics, and lord knows what else. The blog contains too many subjects, actually, but when asked, my readers preferred it this way rather than having me split up the blog. Silly readers. Instead, use the labels to find just the topics you want. The blog has been pretty slow, lately, as I am working on a book. and some of my literature parodies. Please feel free to comment or to subscribe to my blog by email or RSS using the links on the top left. If you like what you see, a donation, a purchase through an affiliate link, or a trackback would also be highly appreciated. Things are slow around here while I am working on a book about games. I have been known to spontaneously "give back" to my loyal readers, commenters, supporters, and subscribers, so stick around! Mere days after I post a Blogger Code of Ethics, Kathy Sierra posts about having to withdraw from a conference, and possibly blogging altogether, due to violent threats to her life, some with sexual overtones, from a few bloggers and commenters. Kathy writes probably the best technical, inspirational blog in existence, Creating Passionate Users. I've been a passionate reader of hers ever since I knew it existed. Every post she writes is a treasure. She never has a bad word to say about other people; she's not contentious or negative. Why she has been attacked with this type of vitriol is beyond me. Probably, there are simply a**holes who think that being negative, especially against good people, makes them cool. Of the alleged attackers [Update: sorry, not attackers, but people responsible for and major contributors to the sites she named; the attacks were generally made anonymously], one has apologized. The rest are attacking again, claiming that she is besmirching them, and picking apart the words of a woman who is distraught and in fear for her life. Well done. Anyone remember what number that hits on the apology scale? I don't defend punishing someone for something that you are also guilty of, but try to keep secret. I also don't defend lecturing about something that you don't really believe in. What I defend is, in some situations, telling someone to do something that you don't. Without this type of hypocrisy, the world collapses. Ideals are, by definition, hard to achieve. We progress not by making our goals so easy that no effort is required, but by setting goals that are obtainable only after a long series of trials and errors. The fact is that even the best of people have trouble living up to ideals. This fact is not justification for discarding the ideals, even when the people who fail at them tell us to strive for them. In fact, sometimes it is the very people who have failed who are the people we should listen to most. An addicted smoker whose lungs are collapsing can make a powerful argument not to begin smoking, or to quit while you can, even when he isn't able to do so. We use every opportunity to not fulfill our ideals, and that includes finding any person who doesn't fulfill them as justification for us not to. We find one authority figure who has failed, and say "well, if it's good enough for him ..."
In this way we have perfected the art of sinking to the lowest common denominator of behavior. You'll notice that the argument never seems to work the other way. We don't point to an authority figure who lives up to the ideal and say "well, if he can do it ..." Not when it conflicts with something we want to do, anyway. I believe that we need to stop using hypocrisy as an excuse for our own low moral standards and behavior. We should listen to people when they tell us something important, even if the person telling us is less than perfect. We should stop being afraid of expressing ideals. If we wait until we are perfect before we speak, we will not speak at all. Don't let others use our own failures as an excuse. Two wrongs don't make it right. Ideals do not suffer in the hands of man; man can only fail to live up to them. Man suffers when he runs from ideals, instead of to them. I am helping a collector purchase a few Israeli games and have them shipped to UK. It's nice to be able to help out. Bernie, this is for you: Dashka Slater on Salon complains about how people use "fun" to mean "important", and "important" to mean "fun". None of which I really want to inflict on you. 84% of British parents want to play more board games with their kids, according to The Daily Record. YourPropertyClub complains that the one lesson you learned from Monopoly - namely, tangible hands on money management - is now gone in the new credit card version. So how come I've never been Dugg? So when will I ever get Dugg? Don't forget to find all ten pieces of hametz and the afikomen. In America, supermarkets are colored black and orange before Halloween. Happy turkeys are led to the slaughter before Thanksgiving. And red and green banners mingle with snow and santas around, say, nine months before Christmas. Passover: boxes of matza, matza meal, wines, kosher l'pesach this and that, such as cereals and cakes, and lots of dishes and silverware. Lag Ba'omer: barbecues, coals, and tongs, and meats. Shavuot: dairy products and cheesecakes. Rosh Hashana: honey, honey cakes, wines, and apples, along with honey serving trays and nuts. Hanukkah: oil, potatoes, gold-foil covered coins, candles, and menorahs. Tu B'shvat, nuts and dried fruit, loose an in gift baskets. Purim: hametashen, noisemakers, candies and little bottles of wine for shaloch manot. Drink wine and eat matza and vegetables on Passover. Eat meat on Lag Ba'Omer. Don't eat for a few months. Eat honey and cakes on Rosh Hashana. Beg some food from your neighbors on Sukkot. Eat oils, donuts, and salty snacks on Hanukkah. Eat fruits on Tu B'shvat. Eat whatever is left on Purim. Drink the rest of the wine. Wash the dishes(*) and sweep up the crumbs. The funny thing about Passover foodstuffs in the supermarket is the mingling of old and new products. For many years, we were astonished that we could buy store-bought cookies at all. They were terrible, but they were cookies! For Passover! These same cookies lasted for about fifty years. In the last twenty years or so, we began making progress with Passover baking, until today when we have a ridiculously large selection of incredibly good cakes and cookies for Passover. But the old one, the ones our mothers and grandmothers bought, are still available, and still terrible. They continue to sell because of brand recognition. Sounds like another industry I know. In Israel we have a vast mixture of "kitniyot" and "non-kitniyot" products, which means stuff Ashkenazim don't eat, and stuff that everyone eats. Unfortunately, despite the fact that there are vast levels of differences in levels of kitniyot, everything that anyone even suspects of being kitniyot to some group is simply labeled kitniyot. The assumption is that people are too dumb to understand the complexities, so better safe than sorry. Unfortunately, they're right, and the vast majority of Ashkenazim swallow this (or don't swallow this) by refraining from buying anything labeled kitniyot, even if the ingredient only "became kitniyot" last year due to a phonetic misunderstanding. For instance, until three years ago, the only cheap oil that Ashkenazim ate was cotton-seed oil or "shemen cotenet". In the last year or two, someone decided that "cotenet" sounds too much like "kitniyot", so it should be labeled kitniyot to avoid confusion. Now cotton seed oil is pretty disgusting, and no one uses it except Ashkenazim on Passover. As a result, you won't find any cotton-seed oil on shelves this year. The same is true for derivatives of kitniyot, newly "discovered" kitniyot, and so forth. I researched the issue and decided to do hataras nedarim on the later kitniyot abuses, and so now only keep the original and major kitniyot laws. And the latter only for tradition and family's sake, since, as an Israeli, I could probably just declare myself bound by the custom of the state, which is not to observe kitniyot at all. But consult your Rabbi or posek, please. To add insult to injury, if keeping time by the supermarket wasn't bad enough, the radio station advertisements are here to help us out. For the month leading up to any holiday, especially Passover, the jingles are all bastardizations of popular melodies relating to that holiday. "Who knows one? I know one! One is the best body wax service in the heaven and the Earth! Accepted by all major health clinics!" Passover Game: A traditional Passover game is to hide ten pieces of bread around the house so that when you go searching your house to remove all hametz, you make sure to find these pieces of bread. This is a dumb game, because if you fail, you end up having pieces of bread in your house over Passover. I suggest instead to simply hide ten pieces of paper that say "hametz" on them. (*) Ah, just throw 'em out and buy new ones. First of all, I would like to apologize to the writer of most-expensive.net . He wrote a small post about the two most expensive chess sets that got Dugg about a zillion times, while my post about the top ten most expensive board games got Dugg only 6 times (now 9 times). In a fit of frustration, bad manners, and probably envy, I called his site a "spam" site after a cursory glance at his post (it looked like a spam site to me), and then proceeded to wonder out loud on Digg as to why his post would get Dugg a zillion times and mine didn't. My attack was inexcusable and rude. Most-expensive.net is not a spam site, and I'm very sorry for writing that. Furthermore, if I don't get Dugg, that's my problem, not his. 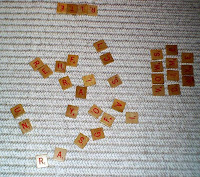 We'll start with a game of Scrabble I played earlier in the week with Rachel. I got the Z, Q, X, J, K, two S's, and both blanks, the last two at the same time. I'm assuming that you can guess the results of that game. Let's move on to the game I played Friday night with both Rachel and Tal, my 14 year old. Tal is still a beginner to Scrabble, and thus she and I decided to play without points. Rachel was aghast. I think her brain began to explode. She kept wondering what the point of the game was if she didn't know if she was winning or not. She put down words and tried to taunt me that it wasn't her best word because it didn't matter, and then she was confused when that didn't seem to bother me. In case you couldn't figure this out, she's kind of competitive. I was happy that my first word was HACKER. Tal had a gang of friends over and they played Apples to Apples, and then followed it up with The Menorah Game. They all like the game wished that I wasn't changing the theme. Assembly Line 1/1 - All your production buildings have additional circle. Poorhouse 2/1 - +1 GP if you have 0 or 1 GP after building. Small Fashion District 2/1 - +2 GP for trading indigo. Small Warehouse 3/1 - Store all barrels of one good. Irrigation 4/2 - +1 barrel of one good you produced. Commodity Exporters 5/2 - +1 VP when shipping indigo or sugar. Large Market 5/2 - +2 GP for trade. Discretionary Hold 6/2 - 1. Store 3 barrels of any combination of goods. 2. Place 1 barrel on each full ship for +1 VP. Factory 7/3 - +0/1/2/3/5 GP for producing 1/2/3/4/5 goods. Large General Workhouse (2 circles) 8/3 - Produce any barrels with matching plantations. Large Business 8/3 - 1. -1 GP cost for each building. 2. +1 VP if you ship, once per Captain phase. Wharf 9/3 - Load once onto your own ship of infinite capacity. Metalworkers 10/4 - +2 GP/quarry. Reserves 10/4 - +2 VP/good on your board. Fortress 10/4 - +1 VP/3 colonists. City Hall 10/4 - +1 VP/indigo building. Custom's House 10/4 - +1 VP/4 shipping points. It was an unusual game in that every single building, with the exception of Large Business, Wharf, Coffee Roaster, and Metalworkers was bought. Yes, including all of the 4 to 6 cost buildings. I think I finally have some good replacements for Office. JSGC Games Day is being planned for Wed, April 4. Come one come all. Two hippos are standing around in a swamp. One looks around confused. Finally, he says: "I keep thinking it's Tuesday." Peter Roizen writes to suggest Wildwords to me, after I ragged on Scrabble. Another reader is looking for a "Jewish themed RPG". Any suggestions? The Goat Game, helping women build better relationships. Among other things, you can learn "flirting without coming on like a tease". My top 10 board games will not be your top 10 board games, and that's how it should be. In my limited experience, no person has the exact same likes and dislikes as any other person. Likely this is due to a complicated inter-tangling of nature and nurture. If you are interested in learning about good games, and you have no game history or only experience with "the classics", check out my Gift Guide for some good introductory games. If you are looking for the best party games, best war games, best video games, best group activities, or any other such list, this isn't it. Try the Geeklists on Board Game Geek (for all but the video games). Lastly, I excluded card games from this list; likely I will follow up with a post for those soon enough. There are complex games with complex rules, and simple games with simple rules. Rarely do you find a complex game with simple rules. Sometimes the rules of a game seem so beautiful they appear to have been discovered, rather than created. Such is the case with Claudia Hely and Roman Pelek's Santiago. Tiles are flipped. You bid on them and place them. You bid on where the water goes. The unwatered ones dry up. At the end of the game, you score based on the number of workers you have on each area times the size of the area. A few other details, and that's it. It just an elegant game. Every times I play it, I find myself saying that during the second or third round again. I've never had a bad experience with it. Its only drawback is that some people feel the need to calculate and re-calculate each move, which can slow the game down. This game is much better than it has any right to be. Designed by Wolfgang Kramer and Richard Ulrich, this is one of the quietest game experiences. 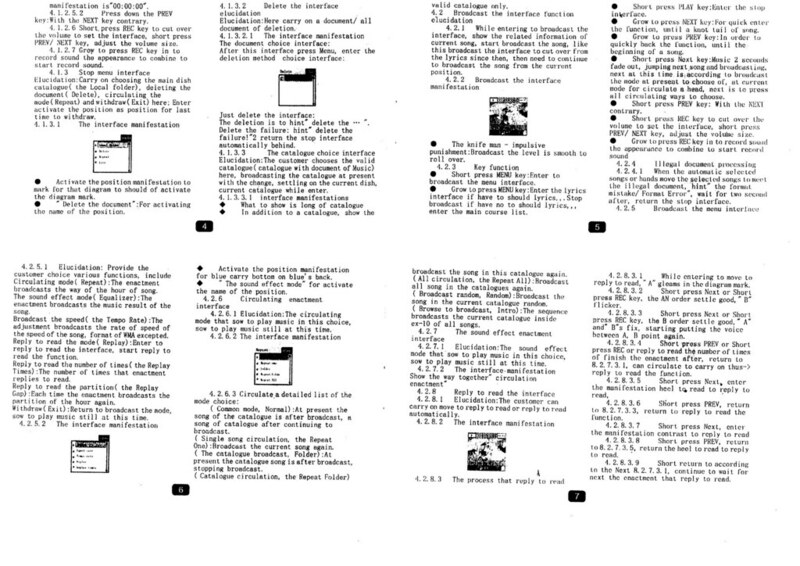 Only seven rounds long, each player has only fourteen actions to choose for the entire game. Your success depends on using each action to its utmost efficiency. In this game you play princes attempting to develop useful and pastoral areas in your municipality in order to attract scientists and artists to produce works. The better your success, the better the works are produced, earning you prestige. Some of this prestige you will need to trade for much needed cash, while the rest will apply to your final score. Often as not, you will be hitting yourself on the head in round 5 for something you did in round 2 The only consolation you will have is that others may have done the same thing. I honestly can't explain why it works so well, but it does. The game works magnificently with 4 or 5 players, but with 5 players you need to remove the last Profession card and make it available only for recruiting, in order to ensure balance. With three players, you need to change the auctions slightly to maintain the tension experienced in the 4 and 5 player game. Scrabble is a great game; it almost made this list. However, Scrabble has a few serious drawbacks. Firstly, its rather rigid game play can be dull. Second, like Chess, the game has been taken over from a thinking man's game to a memorizing man's game. It's no fun to lose to someone who knows more two-letter words than you do. A game that I love much more is Anagrams. Anagrams also require a large vocabulary, but it more rewards fast and creative thinking and patter recognition. In Anagrams, tiles are flipped over one by one. As soon as you see a three-letter word or more, you call it out and gain the tiles. Also, if you can combine any words or letter with words by rearranging the letters, you can call out the new word and steal other player's words. The game is quick and challenging. You can play it with a box of Scrabble pieces. And it makes you a better Scrabble player, too. Another entry by the great Wolfgang Kramer and Richard Ulrich, this is the definitive thematic area-control game. Set in medieval Spain, you are grandes trying to use your cabilleros to curry favor with the king. You place your caballeros in the various areas around Spain or in the castillo. Points are awarded for the top three positions in each area after every three rounds. El Grande is packed with brilliant mechanisms: the trackable but hidden scoring of the castillo, the movement of the king determining when you can place your caballeros, the trade-off between higher and lower power cards and higher and lower action cards, and the way fortunes all around can swing by simply moving a single caballero from one location to another. The chaos of the last mechanism makes the game more of a tactical game than a long-term planning game, but the game is not wholly devoid of strategy, the main one being whether to concentrate on a few high valued areas or go for second place in a greater number of areas. The rules are easy, and the game is a lot of fun. The game works best with four or five players. With three it has less tension. The game can take a bit too long with some players. You may want to cut out a round or two in this case. And lastly, while players can plan around most of the randomness, just occasionally bad luck with a flipped action card can ruin your well made plans. Reiner Knizia, possibly unheard of outside the gaming community, is the game community's mega-star. Many of his games are light card games with dirt simple mechanics and very quick game play. Occasionally, however, he makes a medium weight board game. 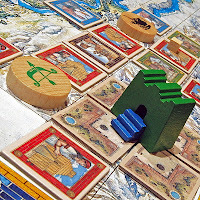 Tigris and Euphrates (T&E) is Reiner's masterpiece medium weight board game. While some complain that it's light on theme, the theme actually fits nicely with the grand scale abstract nature of the mechanics. In T&E, players play civilizations as they rise and fall in ancient Mesopotamia, vying for a stake in four spheres of control in ever-expanding, merging, and revolting kingdoms. Conflicts are political in nature. Rewards are given for each turns activity; your kingdom's size and position determines your stability, not your score. And you must score in all four regions equally to gain points, as your ultimate score is determined by whatever you have gained least. The rules are not that complicated, but the implications of each play are often mind-reeling. A bit of luck adds spice to each round's activity. The game has essentially two drawbacks. First, while you can work around bad luck draws, sometimes they really do a bit of damage. And second, a few poorly chosen conflicts initiated by one player can hand the game to another player despite all of your hard work. 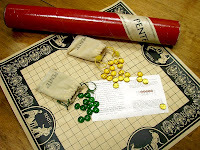 Pente is a simple abstract game very much derived from a whole genre of games played for thousands of years in the East. It was invented by Gary Gabrel. In Pente, you simply have to get 5 stones in a row. However, you can also capture a pair of two stones in a row by placing your stones on either ends of these two stones. You also win if you make 5 such captures. This is an intense and generally very quick game. While the first player appears to have somewhat of an advantage, I haven't seen this translated into any easy victories excepting when the second player makes some basic mistakes. More often, it is a cat and mouse game of "sente", trying to gain control and force a winning position. A more difficult version of the game, which I haven't yet played, is called "Keryo Pente", which allows capturing either two or three stones in a row, and requires you to either get five in a row or capture a total of fifteen stones. What I love about it most is that I can challenge master Go players and beat them on the very same board they can destroy me in Go. Train games are their own genre of games, and have a long history. There's something pleasing about seeing a once naked board slowly and surely covered by a connecting series of rails and trains. And, whether the payoff is based on cities connected, efficient routes, or transport of goods, you know when you're done that you've accomplished something grand. There are many trains games too light for me, and many too dull or too long for me. Created by Martin Wallace, Age of Steam is vicious and engrossing, combining not only track efficiency and good transportation, but clever role selection and money management. It all combines to make an intense enjoyable game, which feels shorter than its three hour length. To be honest, Age of Steam isn't the perfect game. It has a strange leader balancing method which doesn't balance very much. And the randomness of where goods get produced can be a bit of a pain. I've never played Union Pacific or any of the 18xx series. 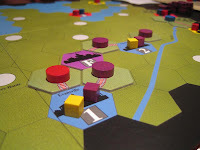 I enjoyed my own train game that I created to play on the Settlers of Catan board as much as Age of Steam. I suspect that I'm still waiting for the perfect train game. More information about Age of Steam can be found here. Designed by Peter Olotka, Jack Kittredge, and Bill Eberle, many people consider this the grand-daddy of the modern board game movement and for good reason. Possibly fifteen years before its time, Cosmic is a wild and fun game of diplomacy that is never the same twice. Not simply because alliances and battles rise and fall. But because each player plays with a random alien power that can break the rules of the game. Not content with the chaos that causes, Cosmic provides dozens of types of special cards, cards that balance or complement the powers, the ability to play with multiple powers, an optional monetary system, and so on and so on. The best you can hope for on any turn is for all the hidden cards and effects to somehow balance each other, so that when the dust settles, you may end up winning. But for all that, unlike games where looniness is the sole ingredient, the combination of strategy, diplomacy, and tactics will usually win the day. Cosmic is one of the few games where joint wins are common; in fact, sometimes everyone wins! Richard Garfield cites Cosmic as on of his sources of design inspiration for the card game Magic: the Gathering. My mantra is that all games are better the closer they are to Cosmic Encounter. Cosmic has been produced by several publishers; the best versions of the game have 75 or more powers, support up to six players, and include the "Flare" cards - the EON and Mayfair versions. Unfortunately, you have to pay a pretty penny for these out of print versions on eBay. More information about Cosmic Encounter can be found here. 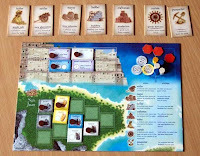 Puerto Rico is the number one game on Board Game Geek, the Internet Board Game list, and dozens of other sites, and has been since its release in 2002. Why? It's brilliant role mechanism system combined with limited buildings. Unlike traditional games, where each player takes a turn and play then passes to the next player, or war games, where each element of the turn is executed in rigid order in turn by each player, Puerto Rico combines these in an unusual way. One player picks any action he or she wants, and all players do this action. The next player picks any of the remaining actions and all payers do that action. And so on until all players have picked an action. Then the actions are returned and the first choice of actions passes to the left. The result is a game where the steps of each turn are executed out of order each turn. Each step is beneficial, but the timing determines if the step is slightly more beneficial to one player than another. Combining with the above mechanic are the limited buildings. Each building provides a limited bonus during a certain step. As the game goes on, each player is getting better or worse bonuses for the chosen steps. The whole thing combines to make an extremely intricate and wide tactical space using very few actual mechanics. There's just a hint of randomness as the game goes on (the available plantations to develop), which just proves that a little randomness can have far-reaching long-term effects. I've played it more than a thousand times, and every game is still a joy. Puerto Rico was designed by Andreas Seyfarth. It's difficult to even know how to describe Go, which is so much more than a simple game. At its most basic, you place pieces on the board trying to surround your opponent, or more territory than your opponent. That's it. But on a sufficiently sized board, the game's one type of action, but hundreds of options, make for the deepest game known to man. Every level of experience you gain in the game reveals an entirely new game. First it's patterns, then it's strategies, then it's potentials, then it's I don't know what, because I'm nowhere near a high level, yet. 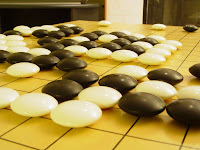 Go is one of the most ancient games, and is considered one of the four arts of the Chinese gentleman, along with calligraphy, painting, and playing the guqin. It hasn't lasted for 4000 years for nothing. Entire TV channels are devoted to the game. Professional Go players are like American professional sports players. Many people actually consider the game itself, or its origin, to be divine. 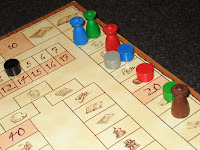 As a game, it requires few components (though many people like to play on expensive and beautiful board) and has a built-in handicap system which make a game enjoyable between any two players, regardless of their experience level. And games can be fairly quick or deep and long, as you like. Go's only drawback is that it is only a two player game. Chess and Scrabble would have made the list, except for the reasons I mentioned above. They tend now to be games of memory rather than creativity. XiangQi, or Chinese Chess, might indeed make the list, except that I haven't yet played it. Another classic which almost made the list is Boggle. The two games Settlers of Catan and Carcassonne are both excellent games. If you haven't yet played them, go play them now! But having played Settlers of Catan more than a thousand times, I find that I can now play it on automatic; it's still fun because of the trading. Carcassonne, while I haven't played it as much, and Settlers, too, are just a bit too much luck-dependent for me. I may change my mind about Carcassonne after playing some of the newer variants. If it weren't my own game, I would add The Menorah Game, or It's Alive as it will be called when it's published, to the list. It's my favorite light auction game, beating out Knizia's three big auction titles Modern Art, Hollywood Blockbuster, and Ra. Two other great games that I considered were Dvonn, the best game of the Gipf series of modern abstract games, and Tikal, an action point exploration game by Wolfgang Kramer and Michael Kiesling. Tikal is a beautiful and fun game, but doesn't quite captivate me the way the ones I listed do. You might be wondering what happened to some of your favorite games, such as Stratego, Clue, Monopoly, Othello, or Trivial Pursuit. While these were good, or even great, games for their times, they simply don't hold up to the games I've listed, at least not for me. I'm sure there are people who love these games even after playing the newer games, but I kind of grew out of them. By the time I was 8, I was already playing Stratego with a random setup because it was no longer interesting doing the setup myself. The game just didn't have enough depth. Clue was the same. We played without using the crib sheets, and both my brother and I still always solved the game at the same time. As a result, the winner was whoever could roll his way to the room fast enough. I never really liked Monopoly. Too much of the game is just doing what the board or the dice tell you to do. Othello is a nice game, and I think it would probably be a great game on a much bigger board. I haven't had the opportunity to try this, yet. And Trivial Pursuit kind of ends once the cards do. It's fun for a party game. 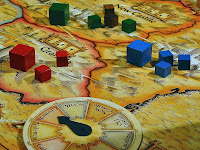 The latest Jerusalem Strategy Gaming Club session report is up here. 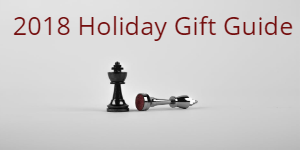 Games played: Geschenkt, Blue Moon City, Dvonn, Tigris and Euphrates, Lord of the Rings: the Confrontation, Tichu, Chess, Zendo, Bridge, The Menorah Game, Go, Checkers. We play Blue Moon City for the first time and say goodbye to David Barren. Gameology reviews a video game with explicitly defined ethical goals. Raph points us to a video game with explicitly defined artistic goals. Table Top Land points to "collectible trading cards" in tea packets. Network Performance Daily equates boundaries with creativity, using Dungeons and Dragons as an example. This is kind of a triple-play for me, because it reminds me of the way people describe the great amount of religious rules in Judaism as liberating, too. An article from a TV segment about how playing games may make your brain stronger (as opposed to TV segments). In Toronto, play Scrabble with the Stars, to benefit the Performing Arts Lodge. First Arab Women's Chess Championship is happening in Tunisia, while Malaysia is going for the national record with its largest Chess tournament. On the surface, "You can do it" sounds like simple words of encouragement. But they are so much more than that. If I really know that you can do it, I inform you that yes, indeed, everything you need to accomplish the task is within your grasp. I affirm that the problem is solvable, and that all the tools that you need have been given. I try to use this with my kids whenever possible. Your inability to start a task may be more due to not knowing that the task is possible than from the amount of effort it will take or that you might fail. If I know that a task is possible, my telling you "You can do it" is conveying information. It says that if you try, you will succeed - or at least, you will succeed if you think a little, try a little, and don't give up too easily. That is usually enough information for my kids to try. Of course, in life you can't always know for certain that something you are about to try is or is not possible. But the lesson of "You can do it" still lingers. You remember that there were tasks that you didn't know you could do, and I told you with knowledge that you could. Now, when you are faced with a situation and no one is telling you that you can do it, you may realize that just because you don't know if you can, doesn't mean that you can't. No, not everything can be done. Sometimes no one will know if you really can do it, or not. Just don't let your uncertainty that it might not be possible stop you from trying. Most of the time, you can do it. Actually, my wife does this one, not only for Passover but for every other holiday, too. This game will make a lot more sense if you've ever seen the television game show Jeopardy!. One large bristol board, 20 to 30 index cards, tape that's not too sticky, and a marker. Think up 4 or 5 categories of questions about Passover, and 5 or 6 questions in each category (examples below). In the illustration, I picked 5 categories and 5 questions in each category. For these choices, you will need 25 index cards. Use 5 index cards for each category, numbered 100 to 500. These hide the "answers" on the board and also represent the points earned for providing the "question" to the answer. Divide the bristol board into 6 rows, by 5 columns. In the top row of each column, write the name of the category. In the remaining rows, write the "answers" to the questions so that the answer fits under the index card. Lightly tape the index cards over the answers, ordered from top to bottom 100 to 500. Use the illustration as a guide. 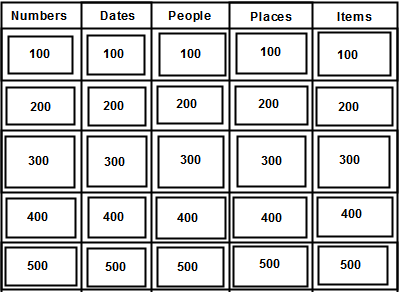 Place the board so that all participants can see it and divide the participants into two or three groups. Taking turns, each group chooses a category and difficulty (the higher the number of points, the more difficult the question). The "answer" is written on the board. The group must ask the correct question for that answer to win th points. If they cannot answer, if they ask the wrong question, or if they say the answer instead of phrasing it as a question, the next group gets to go. If they ask the correct question, they get to go again. You may want to alternate groups anyway, if one group answers too many questions. The game ends when all answers have been revealed. The group with the highest total is the winner, of course. Finding the right "answers" that lead to the right questions is crucial. You can't just use "42" as an answer, since that is the answer to a lot of questions. You have to phrase the answer so that there can be only one correct question. For instance, the answer "the number you get when you multiply 6 times 7" has only one correct question, "What is 42?" or slight variations thereof. Second in importance is ordering the questions from easiest to hardest, so that a 500 points is really worth more than a 100 point question. The exact level of difficulty depends greatly on your group of players. Question: What is the 15th of Nissan? Question: What is the 7th of Adar? Answer: The date of "Second Passover"
Question: What is the 15th of Iyar? Question: What is the 22nd of Nissan? Question: Who was Pharoh's daughter Batya? Question: Who were Datham and Aviram? Question: Who was Nachson Ben Aminadav? Question: What are Pitom and Ramses? Question: What is the bottom of the Nile river? Question: What is a staff? Question: What is flour and water? Question: What is the blood of a lamb? And so on. Make some more questions, and order them according to the level of difficulty they will present to your group.